Celeriac is in season at the moment and you should be able to pick one up in your usual supermarket; although I'd urge you to buy as close to source as possible, if you can pick one up from a farm shop or farmer's market you'll get a bigger, tastier, fresher vegetable and you're sure to notice the difference. You can add celeriac to hundreds of dishes, from stews to curries, they're perfectly timed to come in to season with the cooler months, when we are craving the comfort food that they work best with. I like to use celeriac as a simple side dish, and as many are slightly intimidated by the root's less than attractive appearance, I thought I'd share how I cook it, in the hope that more people give it a chance. If you've tried celeriac before and decided that you're not a fan, give this recipe a chance; I served an oven baked celeriac on Saturday evening with my boyfriend's ten year old son at the table - and he dived in for seconds, having previously said that he didn't like it. Start by scubbing the celeriac root clean. If you've bought a celeriac with the leaves intact, chop these off and set to one side, these are edible and great added to Autumn salads. When you've removed any traces of dirt from the celeriac root, remove any trailing root fingers and fibres, this is easy to do, you don't have to be too fastidious, just pull off any dangly bits! Place your prepared celeriac on a sheet of tin foil. Pour a few glugs of olive oil in to your hands and rub the celeriac all over, then sprinkle with sea salt. Arrange around half a dozen stems of rosemary, and half a dozen stems of dill around the celeriac, then wrap the tin foil tightly around the entire vegetable. Place on a baking tray and bake in the oven at 180 for 2 hours. Once baked, remove the celeriac carefully from the foil, and use a fork to mash up the flesh with a couple of knobs of butter. 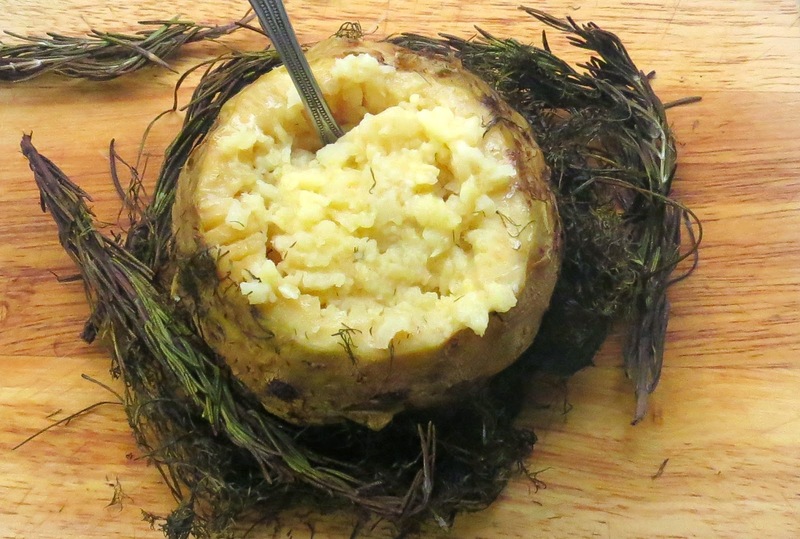 Place the celeriac in the centre of the table with a spoon, and allow everyone to dig in. The baked herbs can be used for presentation if you fancy. If you're looking for other seasonal ideas, I recently published a list of all of the seasonal British produce that's in abundance in October, you can scour the list here.